Pineberries are a kind of strawberry and are grown the same way. Grow in average, medium moisture, well-drained soils in full sun. Prefers organically rich, sandy loams. They are a high maintenance fruit crop which can be grown over much of the United States. Growing recommendations, however, can vary considerably depending upon the climate, and varieties are often regionally adapted. Grow only certified disease-resistant cultivars. University of Missouri-Columbia publishes a pamphlet called ‘Home Fruit Production: Strawberries and Their Culture” (G 6135) which provides some basic information on growing pineberries and strawberries in Missouri. Pineberries are winter hardy to USDA Zones 5-8. Plants are everbearing, but may slow down or stop in the heat of the summer. Plants spread indefinitely by runners that root as they sprawl along the ground. Plants generally dislike high summer heat, humidity and strong drying winds. Propagate from runners. Protect plants over winter with a mulch of straw or grass clippings. This hybrid cannot be grown from seed. Fragaria is a genus containing about 12 species of low-growing stoloniferous herbaceous perennials commonly known as strawberries. 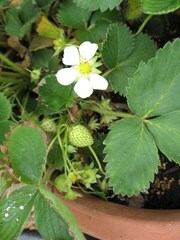 Strawberries are a mainstay of the home fruit garden and are grouped into Junebearing and everbearing types. Junebearers produce one crop per year early in the season (typically June). The berries of Junebearers are normally larger than the berries produced by everbearing or day-neutral plants. They are sensitive to the length of day, and send out runners in spring as day length increases. Everbearing types produce a first crop in spring and then subsequent crops at six week intervals thereafter throughout the summer and into fall. Unlike Junebearers, everbearers are not sensitive to the length of day. Both have five-petaled, white flowers with yellow centers. Flowers appear throughout the growing season on stems clad with tri-foliate green leaves. Flowers give way to large, glossy, red berries which mature in late spring to early summer. Berries are plump, fragrant, sweet and exceedingly tasty. Pineberries were first sold commercially in the U.S. in 2012. The name consists of a combination of the words “pine” from pineapple and “berry” from strawberry in reference to the berries reportedly having a strawberry taste with a hint of pineapple. 'Wonderful' is an everbearing hybrid cross between Fragaria virginiana and Fragaria chiloensis. It typically grows to 8-12” tall and spreads to 10-18” wide. It bears fruit from spring to frost. White flowers have yellowish centers. Flowers and fruits are often seen on the plants at the same time. Fruits are soft white, sometimes tinged with pale pink or pale orange, sporting distinctive and contrasting tiny red seeds. Fruits are smaller in size (to 7/8” long) than typical strawberries. Pineberries are susceptible to a large number of potential diseases, including but not limited to: foliage diseases (leaf spot, scorch), root rots (red stele, black root rot), fruit rots (anthracnose, leather rot), gray mold and viruses. Tarnished plant bugs, spider mites, aphids, leafrollers, slugs, nematodes and strawberry weevils are occasional insect problems. The fruits are quite soft when ripe and do not ship well (a significant problems in terms of commercial shipment of the fruit). Plants have little special ornamental value and are usually grown strictly as edible fruits, The fruits have some ornamental interest and are recommended for growing not only as a food crop but also in beds or containers located near patios or decks. Tower or vertical gardens. Ground cover or border plant. Fruits may be eaten fresh off the vine or cooked into a variety of dishes including pies and jams. Container plants may be brought indoors in winter.